“Please tell me we’re not old enough to be elders,” my friend said when I told her I’d be spending a week at the Modern Elder Academy in Baja, Mexico. And truth be told, I was having a hard time embracing the concept myself. At 53, I hid my age at work, a tech company bustling with 28 year olds. But after reading Wisdom at Work, the book by MEA founder (and fellow Airbnb employee) Chip Conley, I was beginning to recognize the special talents and gifts I had to bring to a company dominated by youth and ambition—not despite my age, but because of it. Attending the academy was my next step in exploring how embracing elderhood would apply to other parts of my life. The academy takes place on a mini-resort Conley is building on a rustic and remote beach two hours north of Cabo. With the waves crashing and whales dancing outside our door, my cohort of 16 gathered in an oversized living room, and began to open up about what we hoped to get out of a week together. These types of retreats are always inspiring to me. Getting permission to journey inward, go deep and doing so alongside others on the same path boosts the experience. The unique aspect of MEA was the blend of personal introspection—yoga, meditation, journaling and opening up about our feelings about getting older—and career or life planning. I would say its main purpose is to plan for the best second half of your life, whatever that looks like for you. Conley, the mastermind behind the MEA is one part corporate American, one part Burning Man, one part wise older brother and all parts love. Under his tutelage, each person got to dive a bit deeper into the specific aspects of their lives they wanted to improve. One of the more meaningful sessions for me was a values clarification exercise. I was able to hone in on my top five values and have been weighing decisions big and small against these values to see how they align. Each cohort has a guest facilitator, who supplements Conley’s core curriculum. 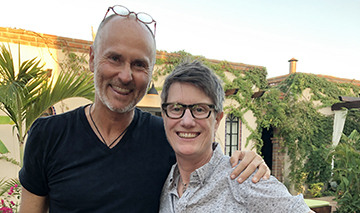 We were blessed to have lesbian tech guru Karen Wickre author the award winning Taking the Work Out of Networking: An Introvert’s Guide to Making Connections That Count, She helped us look at the different ways social media could help us in our careers or other aspirations. The days were filled with journaling sessions, group chats, breakout groups and educational sessions, but the real magic took place in the spaces in-between. The 1:1 conversations over glasses of wine, meals in town, early morning walks on the beach and late night dancing and sing-a longs. It’s where we got to be silly and be vulnerable and open with one another, to offer support or share a story of how we overcame our own struggle and really dive into what motivates us, what moves us, what we want to focus on when we leave. But what about this getting older stuff? Did I come away fully embracing that I’m aging? Not exactly. Being a modern elder isn’t something you learn in a week. In fact, one of the tenets is to embrace becoming a life-long learner. One of the keys to finding fulfillment as you age is to approach life as a “mentern,” a combination of mentor and intern. Freely offering your counsel to those who seek it, while not being afraid to learn about the next cutting edge thing from a younger generation. Wisdom may not come in a week, but gathering the tools and the community to do so can. I’m beginning to learn that for me, becoming an elder is seeking out ways I still want to learn and grow (public speaking, story telling) and the ways I want to give back (volunteering, mentoring younger colleagues). It’s embracing the wrinkles on my face and the vibrancy in my soul. Slowing down isn’t bad, it just gives me more time to appreciate things, ponder thoughts, meander and pay attention. The point is not whether 50 is the new 30. It’s about being open and curious and embracing life’s challenges and opportunities. It’s about making the most out of what precious time we have. It’s about knowing my best years are ahead of me and looking forward them.